What can educators learn from tomato plants? I love a good bargain. So, earlier this summer when I found the infamous Topsy Turvy tomato planter for only one dollar, I bought one. I set up the Topsy Turvy and waited for lots of luscious tomatoes. My tomato plant grew robustly and blossomed. But, the blossoms died one after another with no tomatoes. I did my research and thought I found an answer. When plants are under stress, blossoms die. Apparently, my tomato plant needed a good vacation or a Xanax. Then an informed friend told me it takes two blooming plants in order to have tomatoes. There was another tomato plant, but it was a sad thing. It had fallen from a shelf and broken in half. Rather than throw it out, I potted it. With few stems and no leaves, it resembled little more than a stick in dirt. After a few days, though, it perked up and slowly over several weeks began to look more like a tomato plant. And then one day to my amazement there was a single blossom and then another. I moved the smaller plant next to the larger one and waited to see what would happen. 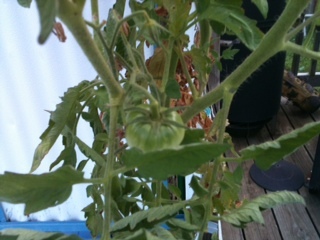 Within days, green tomatoes were growing with more budding out every day. I share this story because, in my opinion, the significance of the two plants struggling apart but thriving together has several implications for educators. What are those implications? How do you deal with stress? What can you do when a fellow teacher is struggling? Or when you are struggling? How do you benefit from collaboration with your fellow educators? How does this story illustrate the importance of persistance?